Come see the beauty of Byers Lake as you glide through tranquil waters on single or tandem Sit-On-Top kayaks. 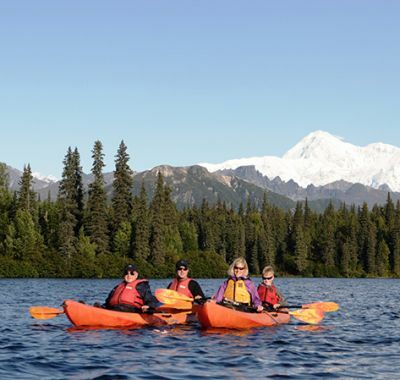 Start your tour with brief and easy paddle instructions then embark on one of the most beautiful experiences in Alaska. Watch for resident trumpeter swans, loons and beavers. Paddle over pools of spawning salmon. Look for the bears and eagles that come to feed on them. Take pictures of the breathtaking views of Denali and the Alaska Mountain Range. This is a great trip for beginners or experienced paddlers as the boats are very stable and easy to maneuver. Minimum age is 5. Maximum weight is 300 lbs. Splash gear, water shoes, dry bag for cameras and personal flotation device will be provided. Tour will operate rain or shine. Tour operates subject to meeting a minimum number of participants. Time on kayak is approximately 2¼ hours. An array of optional tours are available at the Mt. McKinley Princess Wilderness Lodge. To book, visit the Tour Desk at the lodge or call 1-800-426-0500.